a quilt is nice: i've been gone forever. I didn't anticipate it, but I've been gone forever (thanks to those who have sent emails/comments inquiring about me). We welcomed our new baby girl, Elsie, into our home on January 12th, and she has been such a delight. She is so beautiful, and the kids love her. She was a tiny thing weighing 6lbs 2 oz at birth, but has grown so much over the past few months. She's 3 months old now, and I am finally starting to feel like we have some order in our home. Routine has returned, and she is a welcome friend. I have found little bits of time here and there to quilt, and even finished up my One Block Over quilting bee quilt. 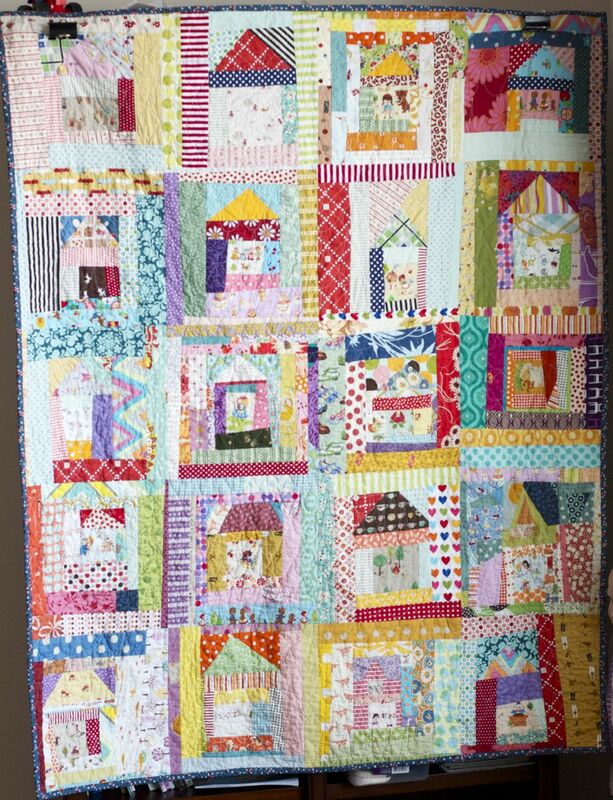 I love this quilt, it's busy and colorful and fun. I quilted scallops, which is new for me, and they aren't perfect, but I like them. I'll definitely be trying them again. I had intended for them to be more like hills instead of valleys, but I was almost half-way finished before I realized they were going the wrong way, and there was no way I was starting over. I think they look like roof shingles, so it fits in nicely with the theme--that's what I tell myself. my favorite part of this quilt is probably the backing. Growing up, my sister had a quilt with this print on it (but red). it's Hollie Hobbie and totally adorable. I found a steal on ebay, and snatched up 4 yards. bound in a dark blue. the quilt is quite lovely as well. She is so sweet! From a teeny little peanut to a nice rolly girl :) And I love the name Elsie. So pretty! I'm glad you're back posting. 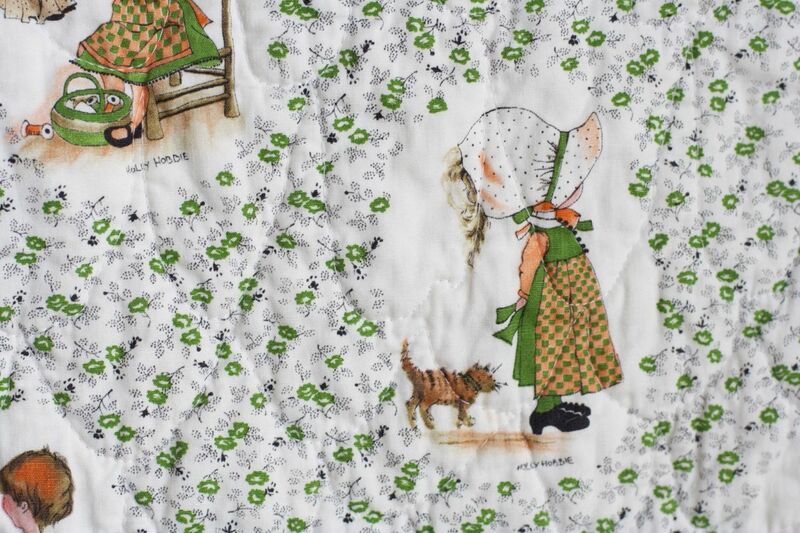 The quilt is really cute too. Congratulations!! She is a beauty! (your new baby mostly.....and the quilt!) I've been checking back here everyday, so it's good to hear everything is well! Congrats on the baby girl! I just had a baby too so i totally understand the lack of sewing time. Oh my, as much as I love the quilt, I think that other little thing is your greatest accomplishment of late. :-) She is precious....congratulations. It takes some time to catch your stride again, yes? Her name is so beautiful....my AMAZING grandmother was named Elsie. I will forever hold that name with very high esteem. She was a magnificent woman. You're taking me back with that Holly Hobbie fabric. Oh the day! I had the doll AND the sleeping bag AND the bedspread. Love it! Oh she's so cute. Oh what a darling. I love her name. Love the quilt. Nice to know you are doing ok.
Its a lovely quilt and congrats on Elsie! She is adorable! 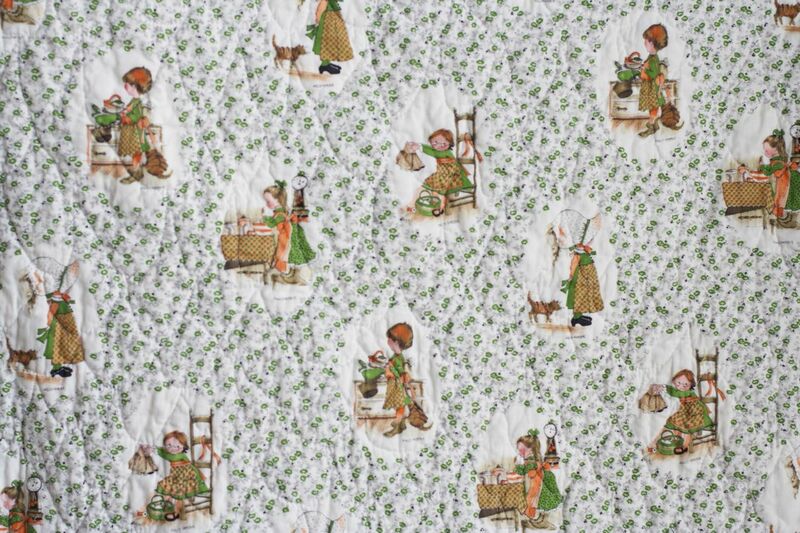 Oh and I'm crushing on your Holly Hobbie fabric. Super cute. Fantastic news! I was just thinking about you the other day, remembering that a little one was due in your life. (And oh, how I know that chaos well these days. Congratulations! And welcome to the world little Elsie. And I love the quilt, especially the binding and the backing. What a sweetie she is. Congratulations on the newest addition to your family. She's darling. I love your quilt. I love the houses, the scallop quilting which i will have to try sometime, and i love the holly hobby back. holly hobby brings me back to my childhood too. Many congratulations and a warm welcome to the world to Elsie. The quilt is so lovely too. She is beautiful! You have been busy. I love your quilt of wonky houses. Congratulations on sweet Elsie! She looks adorable :) And very nice quilt too, will Elsie be allowed to play on it? I still checked at your blog everyday. So happy you are back. Congratulations on your gorgeous little girl. Wish her and her family a wonderful happy life. Welcome back. 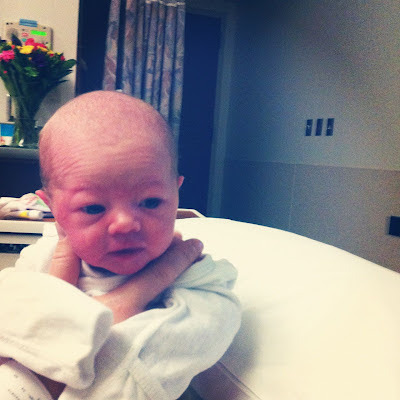 Your baby is adorable and the best excuse to not be blogging. But I'm glad you're back. Congrats to you she is beautiful! I welcomed my third child in december a girl and her name is also Elsie!! your baby girl is a beaute! Congratulations! And you sure can juggle well if you allready found some time for quilting! Well done! Welcome back! Your little girl is ADORABLE! She's an excellent reason for being away from your blog. Love that gorgeous quilt. Wowwowow! First, congratulations! What a cute little babe. 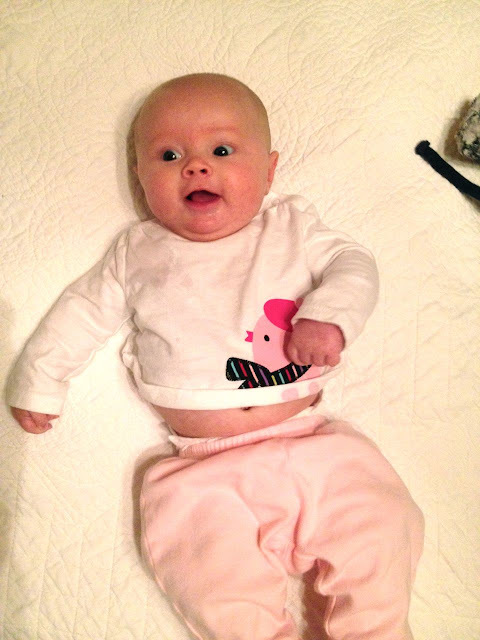 Welcome, Elsie (what a sweet name!)! The quilt is gorgeous. It looks so dreamy and fairytaley. And I love that there are not only houses, but there are little people (!) living in those houses. How adorable! hi nettie, congrats on the baby!! she is adorable!! 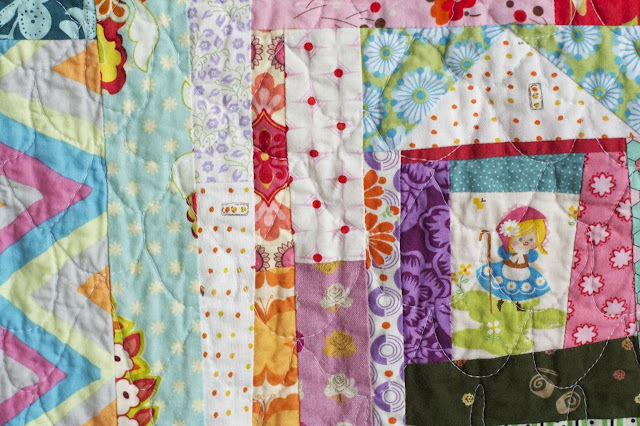 i love the colorful quilt too! i need to get sewing again!!! Congratulations! She's darling:) Good to have you back! Congratulations! The quilt is beautiful, and I recognize the close up block. I wish I would make a whole quilt for myself. Elsie is adorable. She reminds me of Emma--probably because she's bald! Olivia and I were looking at a quilt you made (it's not posted or I'd refer to it) and we had such fun looking at all the fabrics and deciding which were our 'favorites.' Nearly all of them became favorites but the fabric with the goldfish and diver were the best. This quilt is much the same--it would be fun to just look at all the fabrics and enjoy! How lovely. She is beautiful. I just had to comment, because My name is Nettie, and I have a daughter named Elsa. I thought it was neato. What a beautiful beautiful baby! sorry I can't see any quilts when there is a gorgeous baby. Happy Sewing and mothering too! I'm amazed that you were able to get such a busy quilt done with all that you've got going on. So cute! especially the back. It was fun to see you featured on quilt story too. you're an amazing mom. Congratulations on your dear little thing Elsie. What a doll, how tiny was she when she was born, just adorable! nice to see you are back and quilting! I'm expecting baby number 5 and have been spending time organising my sewing room so that at least when baby is here and we are settled that I can find everything and do some quilting! 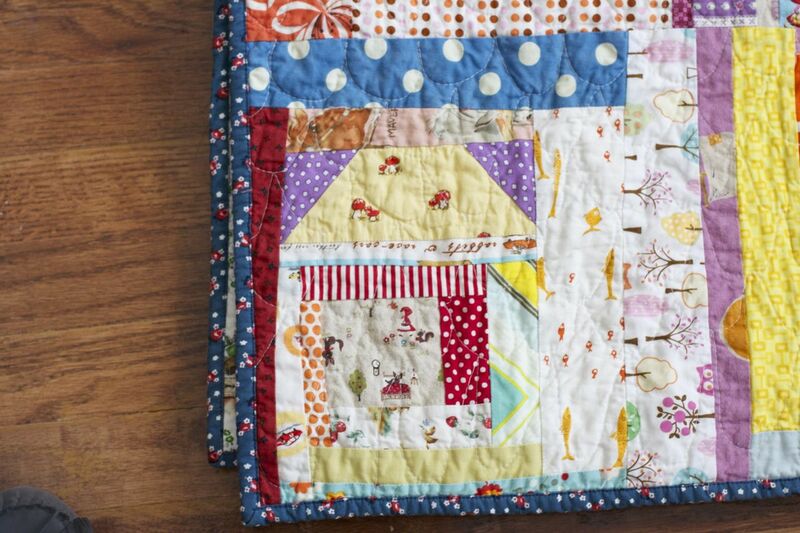 love your house quilt too! so cute! 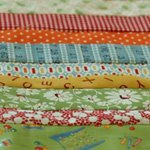 Just started quilting and just discovered your blog! I absolutely love everything you make--it totally jives with the big/bold/colorful theme that I love best in quilts. Are you able to share a pattern for this one?